An upgraded variation of Demon Decapitation. She no longer aims the tip of her blade towards the target's neck, instead she brings her blade back as if sheathing it at her side. Then, using the principles of Iai, she slashes the enemy with blinding speed. It's reach is further extended thanks to a flame wave given off of her blade. Keiko breaks out into an all out charge, using her speed, strength, and momentum in a thrust. Aiming to impale her enemy on her blade! If she uses this as an opening move, it deals increased damage. An upgraded variation of Thunder Thrust. Keiko makes use of Sylph's Wind to strike like lightning. The same principles of the first technique apply, but now it's damage is far more increased, and so too is it's cost. Keiko enters a stance intended to strike away arrows, ward off the harshest of blows, and evade the most dangerous of spells. 'Vahlok' (Vaah-loke) meaning 'Guardian'. Keiko enters a stance that forgoes defense in favor of an overwhelming offense; her blows becoming very fierce and chained together without relent, although this does leave her open to counterattack. 'Kein' (Kah-een) meaning 'War'. 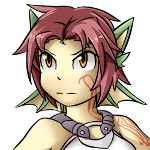 Keiko calls upon elemental properties depending on the stance that she uses; for Normal and Vahlok she will fully utilize the attributes to flow like water, enhancing her defensive capabilities. While for Kein, she is able to call upon the attributes of fire, making each of her attacks a veritable inferno. It's exactly what it says on the tin, although her firebreath is not as grand as the Dragons of old, it is still rather devastating to anything that can consider being bathed in fire a very bad thing. The flames that Keiko can breathe take on an even more intense heat and destructive property, like that of a Drake. Keiko uses the wind to empower herself with greater agility. Keiko uses the power of Earth to increase her physical prowess; namely that of her defense and strength. Greatly enhanced power over Gnome's Earth, Keiko takes the breath of the Earth into her body. This causes a sharp increase in her physical prowess. Keiko closes her eyes and concentrates deeply, enhancing her senses and allowing for more devastating counters and heightened reflexes. Keiko is able to enhance her senses even further, taking the philosophy of becoming like water to newer heights.